Designer and J.B. Taylor has a thing for relic-hunting, especially on the old streets of Paris. PARIS, France – Upon the suggestion of a friend in the neighborhood, we strolled over to the Village St. Paul in the Marais to visit the absolutely addictive Au Petit Bonheur La Chance boutique. It is one of those magical places where you'd have to be missing a heart in order to walk out empty-handed. La Chance is filled to the rafters with the French brocante goods of your dreams. 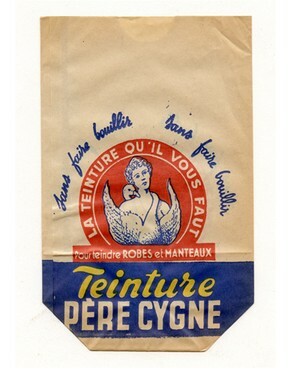 The kitchen linens will lure all the Euros out of your pocket. 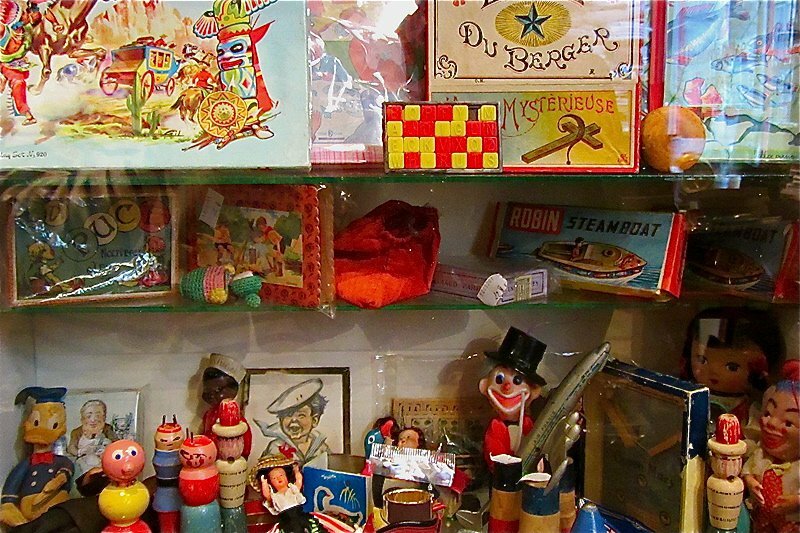 You will fall for the Art Deco latté cups, large antique enamel display letters, embroidered monogram ribbons, '60s teen postcards, and whimsical wind-up toys. Most of the inventory is deadstock vintage, and it's the best place to find tons of cheapy-yet-charming little items to bring back as souvenirs for friends. We spent hours combing through wooden cabinets for inspirational paper ephemera, and blissfully acquired a bounty of Belle Epoque menus, 1930s patisserie bags (see below), school notebooks and wooden stencils. Though if you're totally claustrophobic, like me, you'll want to wait until the shop is devoid of crowds, so as not to have frantic tourists breathing down your neck (the "petit" in the the name isn't an understatement). To ensure good vibes, exit the shop when mobbed and re-enter when the coast is clear. This visit also made me realize that I have an illness. I had planned to arrive home from France with new ballet slippers, perfumes, macarons, and fancy face creams, but all I purchased was old paper. So much, in fact, that I adopted another suitcase in which to bring it on the plane, in addition to the huge boxes I shipped home. I'm still kicking myself for passing up perfect brown leather brogues at Le Bon Marché to save moolah for more obscure old typefaces, but c'est la vie, and vive la papier! Call for hours, as they are precarious. See more Paris shops from our FATHOM Paris Guide. This story was reposted with permission from . J.B. Taylor is a designer, , and the author of : Eats, Boutiques, Decor, Landmarks, Markets & More. She and her husband are the founders , a design and letterpress studio in Hudson Valley, NY. Follow her . She travels for the fulfillment of her bohemian fantasies, and the eternal pursuit of vintage tsotchkes, old paper ephemera, and new things to nosh on.